Wolverines have a close relationship with snow. They raise their kits in snow dens, and on the arctic tundra they dig dens for resting sites as well. As the climate warms, spring snow is melting earlier and earlier, and with it goes the service it provides to wolverines. But what impact does disappearing snow really have on wolverines? To begin to answer this question, we're conducting a study on Alaska's North Slope, in an area bordering the Arctic National Wildlife Refuge, where wolverines dig and use holes in the snow extensively. We're locating sites where wolverines have dug into snow, and measuring snow depth and melt timing at these sites. In addition, we're using GPS telemetry collars on individual wolverines to investigate how snow properties affect their behavior. Scientists and managers are concerned that a diminishing spring snowpack could leave wolverines without suitable habitat - enough so that wolverines are now being considered for listing as threatened in the Lower 48 under the Endangered Species Act. In treeless arctic Alaska, there's very little except snow available to animals for structural protection, so the region presents a perfect location to study the relationship between wolverines and snow. Since snow depth and melt timing could influence how well a site provides protection from predators and harsh weather, it's important to understand the snow characteristics at sites that wolverines choose, and also to investigate how habitat use behaviors are influenced by these snow properties. Our goal is to investigate the impacts that changing snow conditions - caused by climate change - have on wolverines in arctic Alaska. To do this, we will capture wolverines starting in February 2018 and fit them with GPS collars. These collars take the animal's location every 40 minutes, and send the positions back to us via email. In addition, we put temperature loggers on the collars. Since the temperature rises abruptly when an animal goes into a snow hole, we can use these combined instruments (location and temperature) to determine where snow holes are, and exactly how long the animal spends inside. To characterize snow holes used by wolverines, we take snow depth measurements and deploy temperature loggers underneath the snow, which will tell us when the snow melts. Our project is based at Toolik Field Station (TFS, 68.63 ̊N, -149.60 ̊W), which is a National Science Foundation funded research facility operated by the University of Alaska Fairbanks. TFS is a safe, logistically simple place to conduct fieldwork during the arctic winter. Accommodations cost $115 per person per night (one userday), and include housing, food service, high speed internet (crucial for this research), access to tools and mechanical assistance, and emergency support services. This expense - userdays at TFS - is the foundation of our work. It's what keeps us warm and fed during our long, frigid days of fieldwork on the North Slope. The goal of this effort is to raise enough for 40 userdays at Toolik - that's just under three weeks for our team of two (plus 11% fees for Experiment.com) . However, we plan to be there for over 10 weeks total, so every extra bit helps. Every $115 is another round of hot meals, and another night in a warm bed. 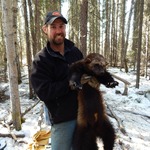 Tom’s research will greatly increase our knowledge of the importance of snow to wolverines. This is important considering how rapidly climate change is altering the quality and consistency of the snow pack. Moreover, Tom’s research is situated well to answer pressing questions related to the affect of future arctic drilling on wolverine ecology. I have worked with Tom on two different wolverine research projects and can attest to his dedication and enthusiasm for wolverine research. Tom has developed an exciting and much needed research program on the specific relationship between wolverines and snow in the arctic, a habitat once thought to be secure for wolverines but now is facing the challenge of a warming climate. This research program has already produced new and very interesting information on snow and wolverines in a tundra environment. Follow along in this upcoming field season as Tom's very capable team brave the arctic winter to investigate the potential effects of a warming climate on the wolverine. 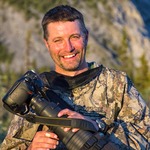 Tom Glass and the WCS Wolverine team are conducting critical research on arctic wolverines and climate change, helping us better understand the threats faced by this species in places like the Arctic National Wildlife Refuge. Please support this important research. We conduct fieldwork in spring, February to May. During this time, we deploy GPS collars on wolverines, and measure snow properties at snow holes. Since we travel mainly by snowmobile, the end of our field season is constrained by when the snow melts. This will be our third and final field season. So far, we’ve captured 15 wolverines and measured snow properties as over 100 holes. With another season, we’ll have enough data for a robust analysis of how wolverines use snow for protection. 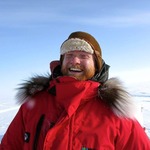 Dr. Martin Robards, director of the Wildlife Conservation Society Arctic Beringia Program, plays a key advisory role in developing and implementing the study plan. Dr. Knut Kielland, arctic and boreal ecologist, brings important perspective from years studying northern carnivores and ecosystems processes. I have a B.A. in biology from Whitman College, and I love wolverines. I'm conducting this research for my MSc at the University of Alaska Fairbanks, with Dr. Knut Kielland. I have spent the last four winters working with wolverines, on the Wolverine and Winter Recreation Project in Jackson, Wyoming, the Wolverine and Industrial Development Project in northern Alberta, and most recently this project, in northern Alaska. I believe that this is one of the most critical unknowns in wolverine biology today, and has widespread implications for the management decisions we make, especially in light of climate change.